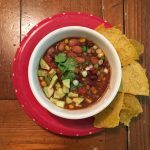 This recipe is inspired by the delicious soup our friend Liz Warner made for our family last week. It is quick and easy to make and can stand alone as a flavorful and hearty vegetarian main dish. We’ve paired it with Ezekiel sprouted corn tortillas, toasted and cut into chips for dipping. Enjoy! Combine all ingredients except last four in large pot on stove and heat to boiling. Add water if needed. Stir in lime juice. Top with sliced green onion, cilantro and avocado. The key to making this a quick dish is to use pre-cooked lentils. Lentils are very easy to cook--just rinse and simmer in water (ratio 1 cup lentils to about 2 1/2 or more cups water) about 40 minutes or until soft. Lentils store in the fridge for several days and are great on salads, in soups, wraps, etc. Wonderful news that you have a new healthy baby boy. Children are God’s best gift in life and keep us all young at heart. Matthew 6:27, And which of you by being anxious can add a single cubit to his life span? Tom is one of your ablation patients, and thanks to you, he is doing great. Thank you so much for your kind words and advice! So glad to hear Tom is doing well!